Since March of this year, it was nearly impossible to avoid news concerning Apple’s iWatch. The buzz surrounding the benefits of wearable technology (WT) was suffocating. 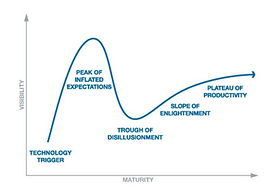 Gartner describes the current stage of WT maturity as the “Peak of Inflated Expectations”. At this nascent stage, WT is all about promise. This peak will inevitably be followed by the “Trough of Disillusionment”. An example of this was Google’s decision to end their Glass Explorer Program, of which Supply Technologies was a participant. But looking at Gartner’s chart, there is hope. Beyond the peak and valley as new technology matures, we realize a slow and steady increase in productivity. Though media attention has focused exclusively on the consumer applications, as WT matures it will have a positive impact improving the efficiency and increasing the transparency of the supply chain. In this blog I would like to explore the potential impact WT will have on the supply chain. A good place to start our discussion on the topic is to establish a definition of what is “wearable technology”. From a recent article, Flextronics, a global Electronics Manufacturing Services (EMS) company, defined WT as “an application-enabled computing device which accepts and processes inputs. This device is generally a fashion accessory usually worn or attached to the body. The device could work independently or be tethered to a smartphone allowing some kind of meaningful interaction with the user.” To that end, WT is about making it easier to gather and disseminate information. Think of a sales force that is no longer required to input information but able to capture leads and sales updates via voice messages without having to take their phone out of their pocket. The ability to push sales updates directly to a device worn on the wrist is all made possible with WT. Recognizing the possibilities, Salesforce.com was quick to announce their Cloud-based analytics app for the iWatch. More complete and timely information leads to better quality decisions. WT facilitates this by streamlining the collection and display of information. In a recent blog post Kylene Zenk-Batford (http://www.mbtmag.com/articles/2014/05/wearable-technology-manufacturing-workplace) highlights potential benefits of WT in the manufacturing realm. From location-aware wristbands to aiding in troubleshooting and problem resolution, WT has the potential to improve the efficiency of your operations. 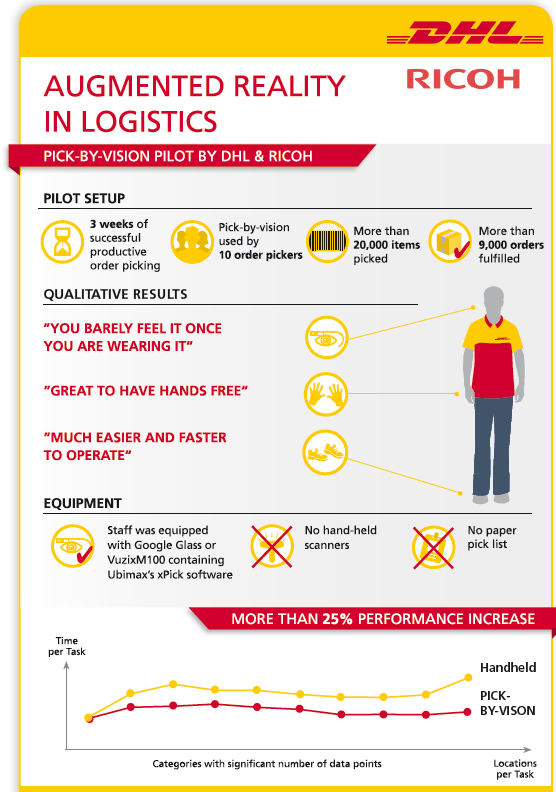 Earlier this year DHL (http://www.dhl.com/en/press/releases/releases_2015/logistics/dhl_successfully_tests_augmented_reality_application_in_warehouse.html) successfully tested the use of smart glasses in their warehousing operations with astonishing results. Their use of smart glasses allowed for “vision picking” where staff was graphically guided through the warehouse. Vision picking allowed for “hands free” “heads up” picking activity. The end result was a 25% increase in picking efficiency and a reduction in errors. Today, The Wall Street Journal reported Google is distributing a new version of Glass to businesses and application developers. Beyond a new look this new version has a faster processor and improved battery life. Google is targeting a fall roll out of “Glass 2.0” along with new programs designed specifically for business. Remember, in time the “Trough of Disillusionment” gives way to the “Slope of Enlightenment”. As DHL’s testing has shown, smart glasses can improve warehouse efficiency. The ability to display relevant information to users without disrupting their work will lead to a reduction in errors. Supply Technologies is always looking at emerging technologies and leveraging these advances to bring more efficiency, better information, and greater transparency to our partnerships. Technology is always changing and always evolving. Today it is all about the iWatch, tomorrow it will be something entirely different. The focus must be on technology not “a” technology. Wearable technology along with custom software applications are some of the many potential tools in our toolbox. This ensures that we will continue our reputation as being “The Efficiency Experts”. © 2019 Supply Technologies LLC. All Rights Reserved. Supply Technologies and Total Supply Management are trademarks of Supply Technologies LLC. All other trademarks are the properties of their respective companies.